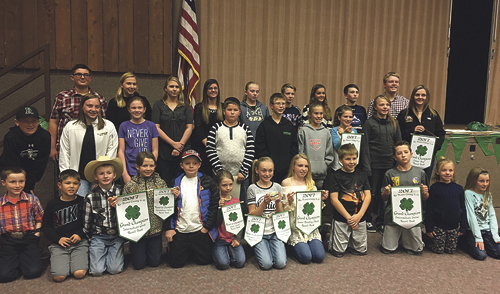 These are all the 4-H kids recognized and honored at the dinner where delicious brisket was provided by county agent Bill Ekstrom supplemented by many fine potluck dishes provided by families. Back row: Corbin Lucero, Anna Forbes, Elena Forbes, ​Kacie Lapp, Kadence Wagner, Drake Miller, Shauna Lapp, Kehlin Myers, Riley Boydstun. ​Second row: ​Kasen LeBleu, Paityn Myers, Jade Miller, Tyson Lewis, Justin Allred, Lexi LeBleu, Emma Winder, Rylee Wagner, Samantha Lapp. Front row: Cash Leischer, Trey Lewis, Cameron Preciado, Savannah Taylor, Dechlin Taylor, Jessa Taylor, Kastyn Dembowski, Ryann Mergelman, Clay Allred, Fischer Winder, Olivia Wagner, Braydin Raley.